It was only two months ago that we were setting up the first iteration of the Brass Knuckles Speak Easy. That original activation was indoors and acted as the centerpiece to the Citrus arena at San Bernandino’s NOS center. 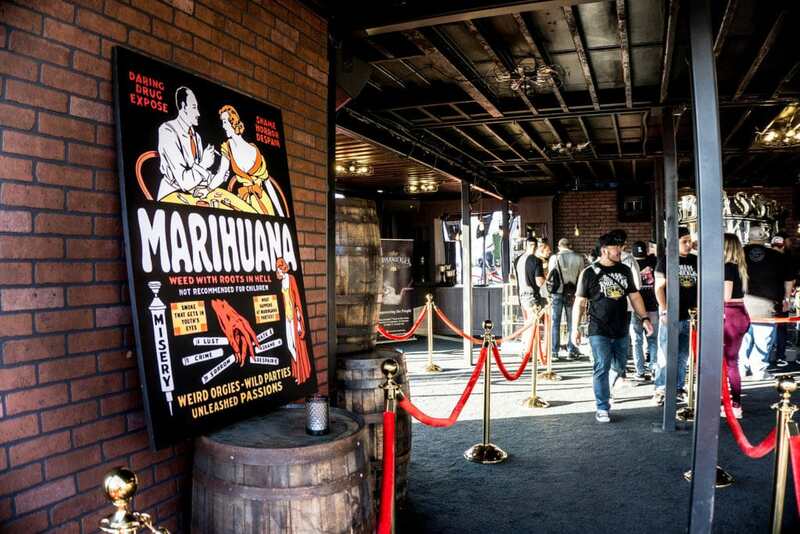 The first speakeasy was a tremendous success that really shook the world of trade show exhibits. We have gotten countless messages from people congratulating us and wanting to know if we would do it again. Well luckily for them, we did do it a second time. This time the stakes would be greater, the environment would be harsher but the speakeasy would be even better! 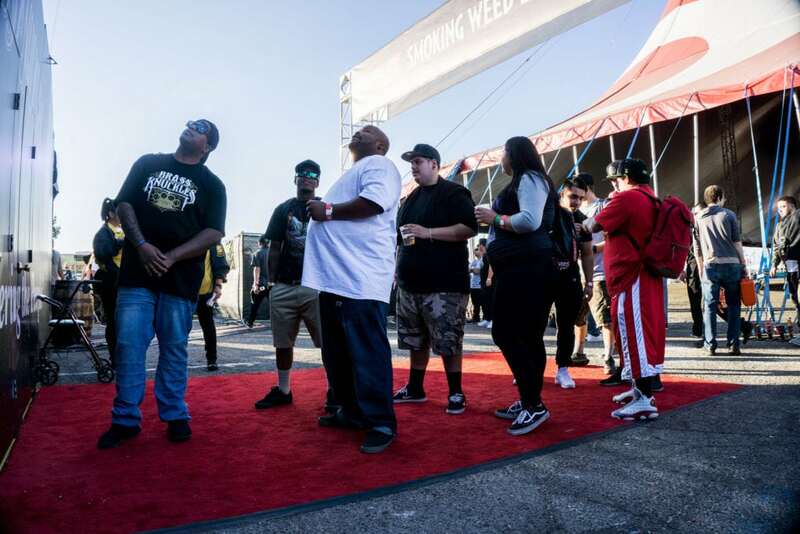 This time around we were contracted to create a Speak Easy 2.o at the High Times Harvest Cup. This time around we would no longer have the luxury of working inside. 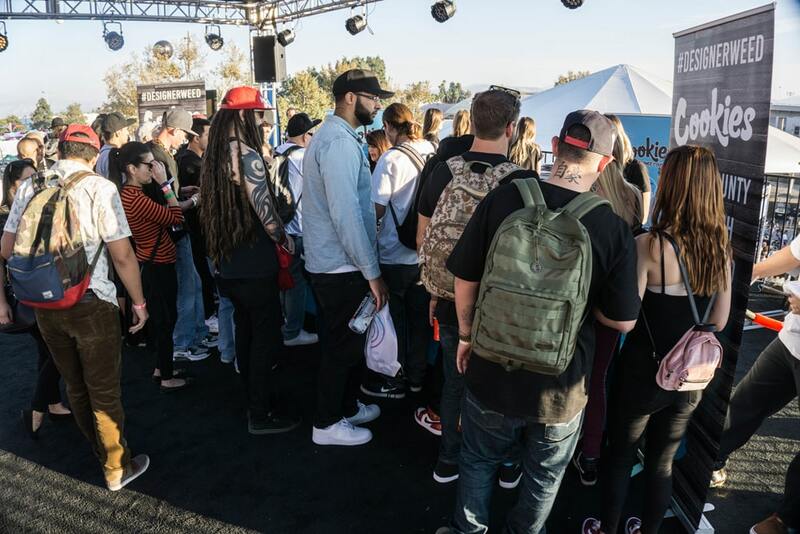 The activation would be right smack dab in the middle of the outdoor pavement at the High Times festival. This means, that every floor had to be modified to meet these new environmental challenges. Also, since the booth would no longer be lit by exterior lighting, we would once again need adjust our lighting accordingly. 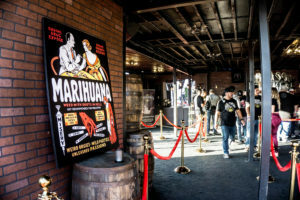 The first floor was host to a variety of changes that would help ease and eliminate some of the traffic issues present in the first iteration of the booth. This time around, Cookiez would be using the third floor as a retail area to sell their product. This meant, that unlike the first iteration, the access way to the third floor could no longer be through the secret brick wall entrances on the first floor. 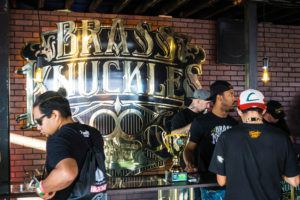 There needed to be an entrance in the back area of the building so that people could enter and exit without disturbing Brass Knuckles Cashwrap on the first floor. Our solution was to add an entrance and an exit on the back facade of the building where people could access the third and second floors without disturbing Brass Knuckles retail cash wrap area on the first. The right side entrance would be used for all patrons traveling up while the left side would take on descending traffic. The Second floor was host to some pretty radical changes as well. The DJ booth that was originally present on the third floor, was now moved down to the second floor where it could be used to entertain guests in this VIP lounge. Audio and visual equipment was adjusted and repositioned to provide an optimal experience based on the feedback we received from the first iteration as well. On top of that, there was now an even more exclusive section which was roped off with stanchions, where the top brass (no pun intended) could sit. The third floor was the floor that saw the biggest overall changes out of any of the three levels. As mentioned before, the brand Cookiez was now sharing the exhibit and using the third floor as a retail area for their products. To accommodate for this, we made space for Cookiez own cash wrap which would be placed at the back of the third floor. The lounge seating was moved in and rearranged to accommodate for the cash wrap and the long lines which would be formed as a result. To add to this, since the building would now be outside, it was imperative that some sort of relief from the sun was added to shield patrons and workers. 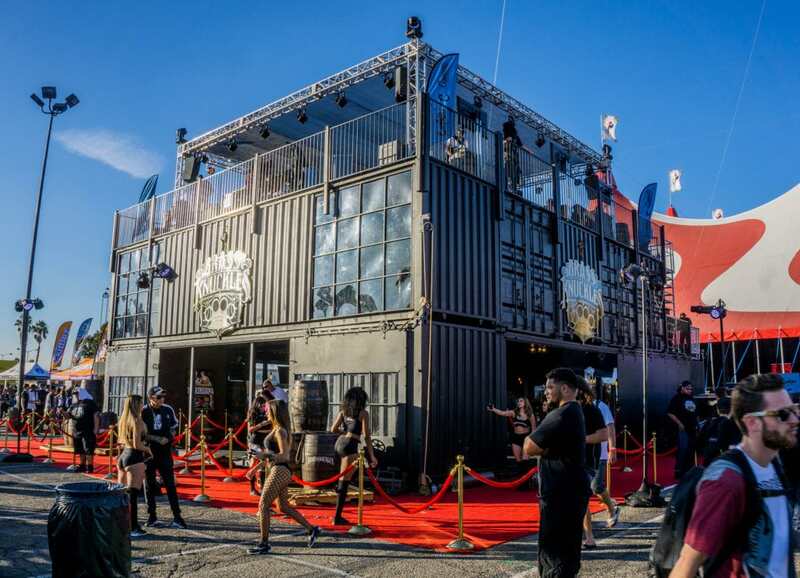 We put a 30′ x 30′ aluminum truss which held lighting equipment for the night time, as well as a huge 30-foot sun shade canvas for the comfort of visitors. 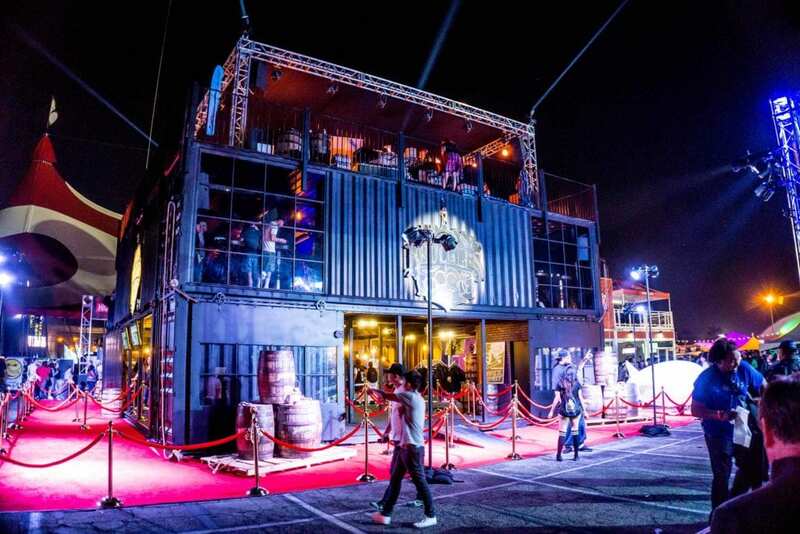 To bring all of this together, the entire structure was completely reoutfitted with new lighting to make it completely outshine its competitors. 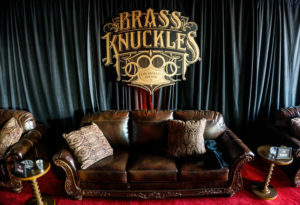 The red carpet and outside of the building was completely surrounded by a brilliant white wash with spotlights focusing on each one of the Brass Knuckles signs. To attract visitors to the building, moving cinema lights were attached to the top of the third-floor truss, which shone brilliantly off into the distance. The final product ended up being such a success, that this booth won the Best Booth award at the High Times Harvest Cup. We are incredibly proud to see the second version of this activation be such a success, and hoped you enjoyed reading about it as much as we enjoyed creating it. Our recap video will be done soon! Here at Acme, we build all sorts of things. 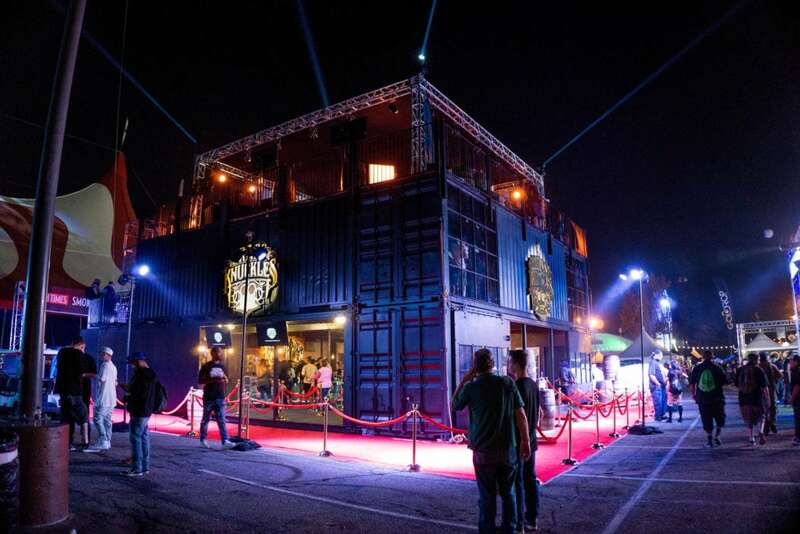 Giant Speak Easy’s and Custom Trade Show Exhibits are just one of the many things we do. We believe the biggest challenges provide the biggest rewards for your brand! We are a 100% turn key brand experience provider and fabricator. 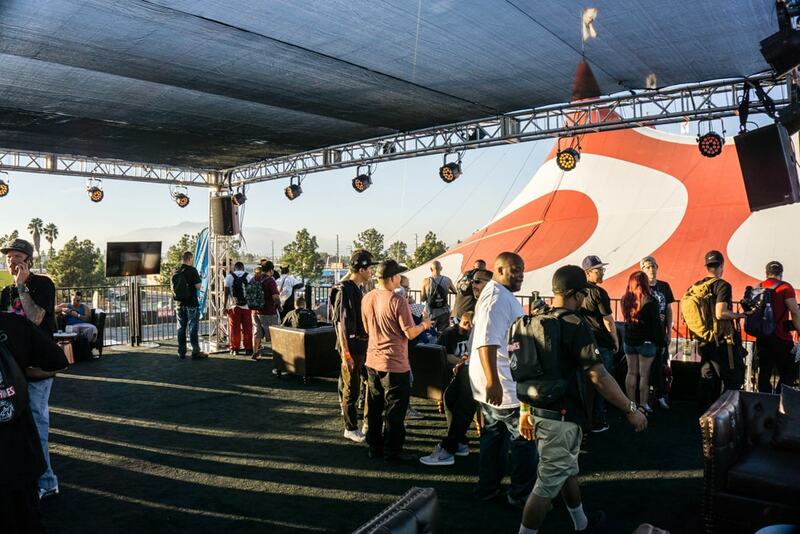 Whether it be mobile pop up shops, custom retail displays., Large Props, Custom Trade Show Booths; We are your guys! No idea too big or too crazy! Experiential Marketers trust us to build out their ideas! Stay tuned for future articles where we dive more in depth into the build process and design choices made for this experience!